This 29 January, 2019, Prime Minister Narendra Modi will again interact with cross section of Students, Teachers and Parents. 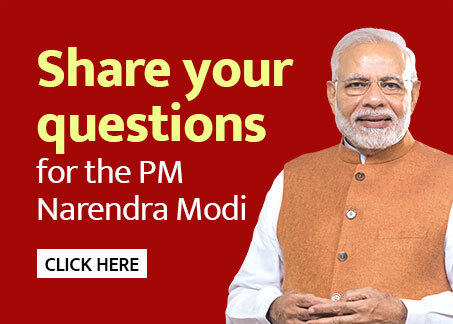 1.Participate in the Pariksha Pe Charcha 2.0 Contest by clicking the “Login and Participate” button below. Catchy Caption Contest: Turn on your creativity. Suggest a caption for the image provided in the Pariksha Pe Charcha 2.0 Contest. Captions cannot exceed 150 characters. Original, punchy, witty, and meaningful captions stand a chance to win. Iam Inspired Contest: Was there something in the book ‘Exam Warriors’ that made you look at exams, or life, differently? It could be a mantra, it could be a concept, or it could be the whole ‘Exam Warriors’ book itself. Tell us one instance or situation where something from ‘Exam Warriors’ inspired you to deal with a situation or do something different. Entries can be in both video (URL of Youtube video of up to 60 seconds) and text (maximum 500 characters). -Teacher’s Thought: Teachers are adept at teaching, whether it is something from the syllabus or in facing challenges. Teachers can give a punchy and short mantra for exam success to students. The mantra should not exceed 500 characters. For further information contact our class teacher.